Located in Antelope County in northeastern Nebraska, Ashfall Fossil Beds State Historical Park is operated by the University of Nebraska State Museum and preserves the site of a rare lagerstätten fossilization event that resulted from the Bruneau-Jarbidge eruption of the Yellowstone supervolcano caldera. The Bruneau-Jarbidge volcanic eruption occurred approximately 12 million years ago during the late Miocene era, in what is now present-day southwest Idaho. An eruption that occurred as part of the Yellowstone supervolcano caldera, the Bruneau-Jarbidge event produced significant ashfall that traveled nearly 1,000 miles west of the eruption site, reaching what is now present-day Nebraska. Up to two feet of powdered glass ash fell on the savannah grasslands of northeastern Nebraska, including a watering hole area that attracted Teleoceras, an early relative of the modern-day rhinoceros. Though most animals located near the watering hole area survived the eruption’s initial ashfall, continued grazing on crops near the site caused an accumulation of glass powder within their bodies over the course of the next several weeks, causing mass die-offs within five weeks of the event. As the bodies of the animals were soon covered by ash drift, many of the skeletons were preserved in their original positions and conditions to the present day, with traces of final meals preserved within the animals’ stomachs. In 1971, the discovery of a juvenile rhinoceros skeleton in an eroding cornfield in northern Nebraska by University of Nebraska State Museum scientist Michael Voorhies prompted further investigation of the ashfall site. The site was purchased by the state of Nebraska in 1987, and upon further excavation revealing its contents, was preserved as Ashfall Fossil Beds State Historical Park in 1991. 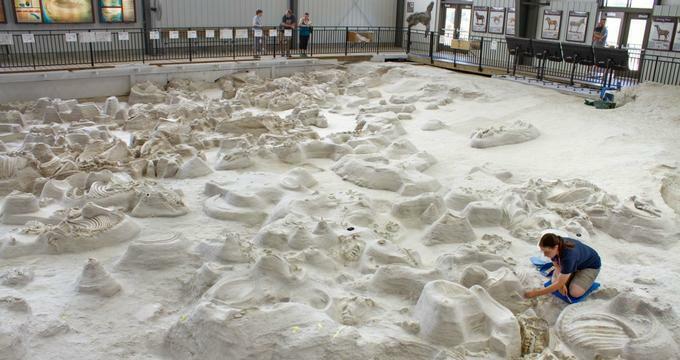 In 2006, the Ashfall Fossil Beds site was designated as a National Natural Landmark, and continued excavation of the site by University of Nebraska State Museum paleontologists continues today. Today, the Ashfall Fossil Beds site is owned and operated by the University of Nebraska State Museum and is open to the public for tours and observation. 17 species of vertebrate animals are preserved at the site, including 12 mammal species. In addition to Teleoceras fossils, which have been found in such a high concentration that the site has earned the nickname the “Rhino Barn,” several prehistoric horse species have been uncovered, including Protohippus, Pliohippus, and Neohipparion fossils. Other species unearthed at the site include Longirostromeryx saber-toothed deer, several genera of camelids and canids, and species of crowned cranes, miocene hawks, and pond turtles. In all, more than 200 fossil skeletons from the Clarendonian Land Mammal Age have been uncovered so far by paleontologists. Due to the unique ashfall conditions at the site, which included the development of erosion-resistant sandstone serving as a caprock above the ash layer, the site is classed as a rare lagerstätten fossil site, preserving bones of animals such as birds and turtles that would not have survived ordinary fossilization conditions. Though some fossil remains bear the mark of predator bites, indicating scavenging at the time of the event, no predator remains have been found within the site. Clues to the region’s climate and ecological condition have also been unearthed, including indicators that the site was home to a much warmer climate than its current condition at the time of the event. A Visitor Center at the Ashfall Fossil Beds site features interpretive displays chronicling the eruption event, the fossilized species, and the site’s history of excavation. Visitors may also observe the site’s excavation areas and working fossil preparation laboratory at the Hubbard Rhino Barn, where visitors are encouraged to ask questions and discuss current excavation progress with onsite paleontologists and interpretive staff. Specially constructed walkways offer a close-up view of current work at the site, although any personal collection of fossils and specimens is prohibited. The Ashfall Fossil Beds State Historical Park excavation site is located on a 360-acre plot of rangeland within the Verdigre Creek Valley. Excavation and visitor facilities are open to the public between May and October and require a valid Nebraska Park Entry Permit for entrance. Nature trails within the site’s surrounding land are available, offering opportunities for interpretation of the area’s geological and biological features. Picnicking on the park site is permitted, and camping is available at the nearby Grove Lake Wildlife Management Area. All park facilities are wheelchair accessible. Guided tours for school groups and organizations are offered between April and October, with all tours requiring advance reservations. Guided group tours last approximately one hour and include an orientation with a tour leader and a full description of the contents and current condition of the fossil beds. Maximum tour group size is 45 participants, although special accommodations for multiple tour packages are available for larger groups.